Posted on Thu, Feb 16, 2012 : 10:36 p.m. The Iowa women’s basketball team has been one of the hottest teams in the Big Ten in the month of February. Thursday night at the Crisler Center, the Hawkeyes went cold. Until the final two minutes of a 58-57 win over Michigan, that is. Iowa hit three consecutive 3-point shots over a 71-second stretch late in the second half and took its first lead of the game in the game's final minute. Michigan’s Sam Arnold missed a pair of potential game-winning jumpers on the Wolverines’ final possession. The Hawkeyes (17-10, 9-5) had averaged 75.2 points while winning their previous five games. After 38 minutes against Michigan (18-8, 7-6), Iowa had been limited to 19 first-half points, missed 21 of 24 shots from 3-point range and trailed the Wolverines 57-49. 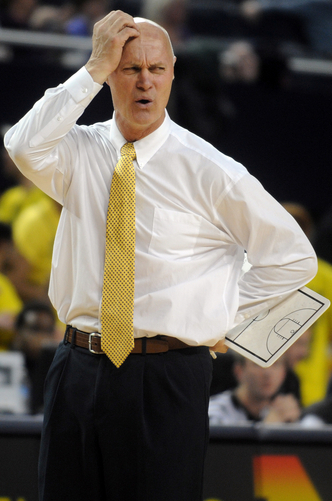 Michigan lost a 14-point lead in the second half on Thursday night, a head-scratcher for coach Kevin Borseth. Senior guard Kamille Wahlin hit a 3-pointer with 1:57 left. Freshman guard Samantha Logic hit another 35 seconds later. Then Wahlin put the Hawkeyes ahead, 58-57, with 46 seconds remaining. Meanwhile, the Wolverines went scoreless for the final 2:12. "In my opinion, getting beat and losing are two different things and I really thought we lost this game," Michigan coach Kevin Borseth said in a post-game press conference. "We had opportunities and nice shots around the rim that didn't go in." Michigan senior Carmen Reynolds had her shot blocked by 6-foot-5 Iowa center Morgan Johnson on the Wolverines’ ensuing possession, forcing Michigan to foul. Wahlin missed the front end of a one-and-one opportunity, giving the Wolverines the last shot at victory. After a timeout with 13.8 seconds left, Michigan junior guard Nya Jordan drove the lane and kicked a pass out to Arnold at the top of the key. Her shot missed, but a long rebound was tipped and ended up back in her hands. A desperation shot at the buzzer also missed. Borseth said the block of Reynolds' shot on the previous possession helped determine the Wolverines shooting a pair of 3-pointers in the final seconds while trailing by just one point. "We tried to get around the basket. We went down with Carmen the time before that and didn't get the foul call, so I didn't know if I wanted to go down around the basket again and put it in the hands of the officials," he said. "I wanted to give us a good shot. Nya turned the corner and got down into the lane, pitched it out to Sam. She's wide open for three. She puts it in and it certainly changes the whole outcome of the game." Wahlin finished with a game-high 18 points and Logic contributed 12 points and 18 rebounds, including nine on the offensive end of the court. Iowa coach Lisa Bluder told HawkeyeSports.com that Wahlin's heroics marked the eighth time in her career that she has hit a shot in the final minute that either tied the game or put the Hawkeyes ahead. Arnold and senior guard Courtney Boylan each scored 12 points for Michigan, which dropped to seventh place in the Big Ten standings. Boylan hit a 3-pointer with 3:02 to play and Arnold followed that basket with a pair of free throws that seemed to give the Wolverines a comfortable 57-49 lead with 2:12 to play -- but they wouldn't score again. "I thought we threw the ball away and missed a lot of layups. Those are the two things that really stick out in my mind," Borseth said. "I'm not exactly sure why, but we turned the ball over three times and we missed a ton of layups around the basket. "If we had made those layups, the dynamics of the game would have changed. When we take care of the ball and make shots, we win, but tonight that did not work for us." Michigan led 33-19 at halftime, but Iowa cut that 14-point deficit to six (38-32) over the first five minutes of the second half. "I'm proud of our team because in the first half we weren't shooting the ball well," Bluder said. "We told them at halftime we're going to win this game with defense and rebounds and that's exactly what we did in the second half." A Wahlin pull-up jumper pulled the Hawkeyes within 44-42 with 7:56 left to play, but Michigan was able to keep Iowa from taking the lead until that late string of 3-point baskets. Sat, Feb 18, 2012 : 6:25 a.m.
Boreseth had no clue at the end of this game. It is time for him to leave quitely and let a staff that help us win take over. Fri, Feb 17, 2012 : 4:11 p.m.
Tough loss for a hardworking, likeable team. Hard to say exactly what went wrong, except the obvious: Iowa made their shots when it mattered most, and we didn't. It did seem like U-M had a tough time finding an offensive rhythm, and that Borseth kept trying different combinations of players, maybe hoping to find one that clicked. Don't know why Boylan and Sheffer played less than they usually do. To my eyes, they seemed to play well when they were in there. Hoping for another bounceback win this weekend! Fri, Feb 17, 2012 : 11:24 a.m.
out rebounded by 18 and sheffer (best post player by far) only plays 20 minutes and not on the floor in the last minutes------those are coaching decisions. Fri, Feb 17, 2012 : 10:34 a.m.